The new generation of FH400B hydraulic retarder with independent intellectual property rights tailored for heavy trucks has been put into mass production a few days ago. This not only breaks the monopoly position of foreign companies in the brake system of heavy-duty vehicles, but also fills domestic The market is blank, providing technical and product support for the upgrading of domestic heavy trucks, winning the praise of users and the market. As an advanced device for assisted braking of transport vehicles, the FH400B hydraulic retarder project has been undergoing five years of R&D and trial production since it was established in 2006. It has completed various related experimental verifications and successfully implemented control procedures and machinery. 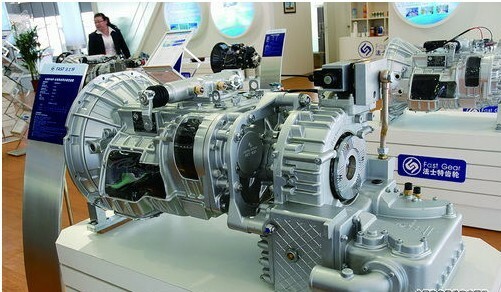 The matching design of the assembly and the matching test of the entire system and the vehicle, and a new installation interface designed according to China's national conditions, so that the FH400B retarder can achieve a maximum retarding torque range of up to 4000Nm, and can be widely matched with the Fast 6th-16th gear. Transmissions, compared with current eddy current retarders that are more commonly used, have the advantages of fast and smooth braking, safe and flexible operation, and good operating economy. Specific performance: light weight, large unit braking torque; soft braking, no impact, high comfort; does not produce a huge electromagnetic field, no additional battery, no impact on the vehicle battery; easy to install, repair, maintenance; With large dynamic power and no declining braking force, it can be considered as a true continuous retarder, and it has won the development opportunity to seize the heavy truck auxiliary brake market. Through a series of independent research and technological innovations, the FH400B hydraulic retarder has broken the intellectual property barriers established by multinational corporations. It has reached the international advanced level in key technologies and core technologies. Its superior retarding performance fully meets the requirements of heavy trucks. The development needs of gears, large tonnages, large horsepower, high-speed and individualized demands of different users provide reliable and safe protection and efficient deceleration braking for medium and heavy trucks. Retarder working principle: The vehicle's huge inertial energy is converted into heat energy through liquid resistance, and then absorbed by the radiator and distributed, so as to achieve the purpose of reducing the speed. In the retarder, two opposed impellers (rotors and stators), the rotor is connected to the drive shaft through the retarder drive shaft, and the stator is fixed on the retarder housing. During slow speed, the oil moves between the two impellers and the oil is accelerated by the rotor and then decelerated by the stator. As a result, the rotor slows down so that the vehicle is braked. The heat generated by the retarding process is rapidly and effectively dissipated through the cooling factor of the vehicle. The basic principle of the retarder: The higher the speed, the higher the available retarding power, up to 950 kW. (When a long downhill slope is encountered, the driver releases the throttle and opens the retarder. This time, the retarder is driven by the rear axle of the vehicle. The rotor in the retarder rotates with the drive shaft in the working chamber at the same speed. At the same time, the controller introduces the vehicle's own air-compressed air into the retarder oil storage chamber, and presses the engine oil through the gas into the retarder's working chamber. The rotor-driven oil acts on the retarder stator due to the stator. After reacting to the rotor, the oil generates a certain resistance to the rotor and forms a braking torque, and generates heat energy.At this time, the resistance of the oil to the rotor forms a braking torque, which is transmitted to the automobile tire through the vehicle drive train, thus serving as a brake. The heat generated is emitted by the engine cooling.